Here’s a quick excerpt of a conversation in the car between me and my 7 year-old daughter, Madison. It struck me later that I’ve had similar conversations over the years. Often in life there are things that we would like to be different. It could be your job, your health, your finances, your house, your relationships, your church. The list goes on and on. If you’re expecting them to somehow automatically change for the better, you could be waiting for a long time. Remember, you’re not a tree. You have the power to choose actions that will change your situation. 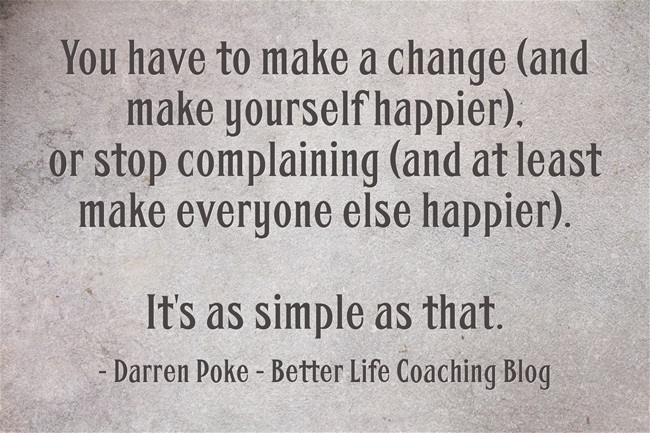 You have to make a change (and make yourself happier), or stop complaining (and at least make everyone else happier). Next post – Cut the Blue Wire! Thanks sir…The article is very very nice.